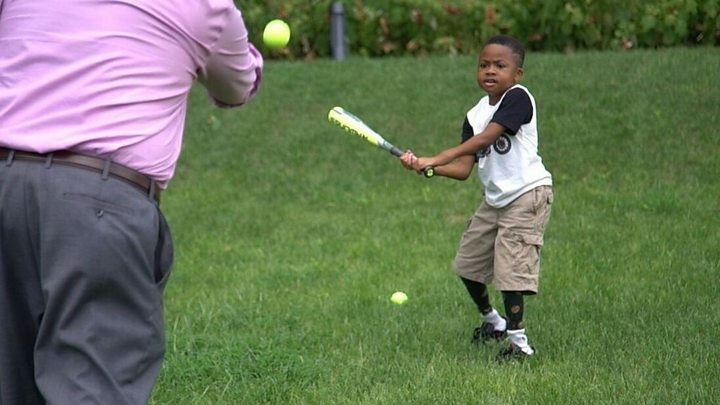 A US boy who made history as the world's first child to have a double hand transplant is now swinging a baseball bat well, his doctors say. It is two years since Zion Harvey, who is now 10, was given new hands, and his doctors say they are amazed by and incredibly proud of his progress. Zion can now write and feed and dress himself, as well as grip a bat. Although his hands came from a donor, his brain has accepted them as his own, medical tests show. Dr Sandra Amaral, a member of the team treating Zion at the Children's Hospital of Philadelphia, told the BBC that Zion continues to make significant progress. "He is able to swing a bat with much more co-ordination, and he can write his name quite clearly. "His sensation continues to improve. It's amazing. "Now he can pat his mother's cheek and feel it." Dr Amaral said there was evidence that his brain had rewired to take account of his new hands. The team has published medical notes about his remarkable story in The Lancet Child and Adolescent Health journal. Zion was born with two hands but when he was aged two, doctors had to amputate them. In his own words: "When I was two I had to get my hands cut off because I was sick." Zion had sepsis, a life-threatening infection. Doctors removed both his hands at the wrist, and his legs below the knee because they were dying. His kidneys also failed. At the age of four, after two years of dialysis, Zion had a kidney transplant using a kidney donated by his mother Pattie Ray. It was another four years before the boy from Baltimore got his new hands. Zion's hand operation in June 2015 was a big deal. Although not the first ever double-hand transplant - that was in 1998 - he was the youngest to ever have the procedure. His doctors say Zion's medical story, along with his positive personality and determination, made him a great candidate. Transplant patients need to take lifelong anti-rejection drugs and these can have bad side-effects, which means the benefits of the surgery must outweigh the risks. Zion was already on this medication for his kidney and after 18 months of close assessment, the medical team was confident a double-hand transplant could benefit him. Next came the wait for a donor of the right size, skin tone and blood group compatibility. Three months later they found a donor. A team of 40 medical staff, including 10 surgeons, operated through the night and into the early hours of the morning to fit Zion's new hands. One of the biggest challenges was connecting up all the tiny blood vessels that would keep the hands alive. Dr Benjamin Chang, co-director of the hand transplant programme at the hospital, recalls: "We wanted to really make sure that this was going to work for our patient and work for a lifetime." Two years on, Zion is doing well. There were a few times in the first year after the transplant that Zion's doctors feared his body was starting to reject the new hands. Thankfully, tweaking his medication helped. His doctors say one of the most promising things they have seen during the recovery period is how well Zion's brain has responded "despite the absence of hands during a developmental period of rich fine motor development between the ages of two and eight years". Speaking about Zion last year, lead surgeon Dr Scott Levin said: "His brain is communicating with his hands. His brain says for his hands to move and they move. And that in and of itself is remarkable."